How to Cite This Chapter: Hategan A, Saperson K, Waserman JE. Neuropsychiatric Symptoms in Dementia. McMaster Textbook of Internal Medicine. Kraków: Medycyna Praktyczna. 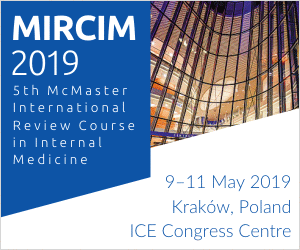 https://empendium.com/mcmtextbook/chapter/B31.II.21.10 Accessed April 25, 2019. Canadian Coalition for Seniors’ Mental Health. National Guidelines for The Assessment and Treatment of Mental Health Issues in Long Term Care Homes. Tool on Pharmacological Treatment of Behavioural Symptoms of Dementia in Long Term Care Facilities for Older Adults. www.ccsmh.ca/wp-content/uploads/2016/03/MHI-in-LTC-Final.pdf. Accessed December 26, 2015. Dudas R, Malouf R, McCleery J, Dening T. Antidepressants for treating depression in dementia. Cochrane Database Syst Rev. 2018 Aug 31;8:CD003944. doi: 10.1002/14651858.CD003944.pub2. Review. PubMed PMID: 30168578. Van Leeuwen E, Petrovic M, van Driel ML, et al. Withdrawal versus continuation of long-term antipsychotic drug use for behavioural and psychological symptoms in older people with dementia. Cochrane Database Syst Rev. 2018 Mar 30;3:CD007726. doi: 10.1002/14651858.CD007726.pub3. [Epub ahead of print] Review. PubMed PMID: 29605970. British Columbia Ministry of Health. Best Practice Guideline for Accommodating and Managing Behavioural and Psychological Symptoms of Dementia in Residential Care: A Person-Centered Interdisciplinary Approach. www.health.gov.bc.ca/library/publications/year/2012/bpsd-guideline.pdf. Published October 25, 2012. Accessed December 26, 2015. Gauthier S, Patterson C, Chertkow H, et al. Recommendations of the 4th Canadian Consensus Conference on the Diagnosis and Treatment of Dementia (CCCDTD4). Can Geriatr J. 2012 Dec;15(4):120-6. doi: 10.5770/cgj.15.49. PubMed PMID: 23259025; PubMed Central PMCID: PMC3516356. Nelson JC, Devanand DP. A systematic review and meta-analysis of placebo-controlled antidepressant studies in people with depression and dementia. J Am Geriatr Soc. 2011 Apr;59(4):577-85. doi: 10.1111/j.1532-5415.2011.03355.x. Review. PubMed PMID: 21453380. Ballard CG, Waite J, Birks J. Atypical antipsychotics for aggression and psychosis in Alzheimer’s disease. Cochrane Database Syst Rev. 2006 Jan 25;(1):CD003476. DOI: 10.1002/14651858.CD003476.pub2. Dementia is a clinical syndrome characterized by progressive cognitive decline and impairment in one or more cognitive domains sufficient to cause decline in daily function. The term “dementia” is subsumed under the newly named entity referred to in the fifth edition of Diagnostic and Statistical Manual of Mental Disorders (DSM-5) as major neurocognitive disorders, which encompasses a group of acquired disorders. Mild neurocognitive disorder is a DSM-5–recognized term for the less severe level of cognitive impairment (also referred to as mild cognitive impairment) (MCI), considered to be a potential prodrome of Alzheimer disease or other neurodegenerative forms of dementia. Individuals with MCI or dementia can present with prominent and disabling behavioral disturbances, termed neuropsychiatric symptoms (NPSs), previously denominated as behavioral and psychological symptoms of dementia (BPSD). These include agitation, depression, apathy, delusions, hallucinations, and sleep impairment. In some cases, they present as clusters, constituting syndromes such as dementia-associated psychotic or mood disturbances. These symptoms have serious adverse consequences for patients and caregivers, such as greater impairment in activities of daily living, more rapid cognitive decline, worse quality of life, earlier institutionalization, and greater caregiver depression. Therefore, the NPSs of dementia are serious conditions that are increasingly becoming a focus of attention. In this chapter, we review the assessment and management of NPSs. Assessment, differential diagnosis, and management of cognitive symptoms in dementia: see Dementia. NPSs can occur in over 90% of patients with dementia, as an isolated symptom or in symptom clusters, and are often the presenting problems in seeking care. They are associated with more rapid disease progression, worse outcomes, and significant distress to the patient and caregivers. The NPSs in patients with dementia may result from a number of precipitants or causal factors, including neurobiologically-related disease factors; patient’s unmet needs (eg, too hot, too cold, hunger, incontinence, need to go to the bathroom); caregiver factors; environmental triggers; and interactions of the patient, caregiver, and environmental factors. It is likely that these potential causal factors are all relevant to differing degrees in an individual patient. The cause of NPSs, while multifactorial, is likely due to regional brain degeneration. In late stages, NPSs may be common to all dementias, irrespective of etiology. Changes in the brain structure impact on brain biology at multiple levels, including neural and neurotransmitter levels. Behaviors may result from these changes affecting the brain function or from the challenges with communication and environment. The traditional view of these behaviors as “challenging” to manage is gradually being replaced with the more person-centered terminology of these being responsive behaviors, in recognition that the behavior represents the brain’s attempts to communicate distress or unmet needs and should cue caregivers to determine potential triggers. NPSs constitute a heterogeneous range of reactions, psychiatric symptoms, and behaviors that may impact the safety and care of patients with MCI or dementia. The most common NPSs in dementia (Table 1) and some of their key symptom presentations are further described below. 1. Agitation is one of the most pervasive symptoms and can occur as a primary symptom or as secondary to other NPSs, including anxiety, depression, or psychosis. It may be associated with verbal (eg, repetitive vocalizations, shouting) or motor (eg, pacing, physical aggression, resistance to care) manifestations and can lead to injury, with significant implications for the safety of the patient and others. Sundowning refers to a specific pattern of agitation, with worsening of agitation in the late afternoon or early evening. Onset of sundowning has been associated with decreased light exposure, timing of medications, and dysfunctional sleep-wake cycles. 2. Apathy may manifest as deficits in thinking, diminished ability to initiate action, and cognitive and emotional blunting. It tends to occur early and increase over the course of the illness. It is important to distinguish from depression, which, unlike apathy, causes great suffering and distress to the patient. Often more distressing to the caregiver than the patient, apathy can be associated with diminished self-care and lead to increased social isolation. 3. Psychotic symptoms in patients with dementia, such as hallucinations and delusions, also frequently occur in delirium, which must be excluded. Visual hallucinations are highly suggestive of delirium but do also occur in neurodegenerative causes of parkinsonism, such as Parkinson disease, dementia with Lewy bodies, progressive supranuclear palsy, multiple system atrophy, and corticobasal degeneration syndrome (types of dementia: see Dementia). Paranoid delusions are the commonest, with themes of theft, infidelity, and misidentification syndromes as the most prominent. Psychotic symptoms can vary in intensity and severity, and if present without causing harm or distress to the patient or others, they may not require active pharmacologic treatment. 5. Disinhibition occurs in approximately one-third of patients and is more common with frontal lobe involvement. Sexually disinhibited or inappropriate behavior is often a source of great distress to caregivers. These behaviors can be caused by neurologic disorders, be associated with medication adverse effects (eg, dopamine agonists for Parkinson disease, benzodiazepines), be part of an undiagnosed bipolar disorder with mania, or occur as a symptom of the dementia. Dementia-related disinhibited behaviors are important to distinguish from mania or hypomania, as this will have significant treatment implications. In individuals with a past personal or family history of bipolar or depressive disorder, a circumscribed trial of a mood stabilizer, if helpful, may provide diagnostic information, but this should not be done routinely and should prompt a referral to a geriatric psychiatrist for diagnostic clarification and management. 6. Sleep-wake cycle disturbances are common and often associated with greater caregiver burden. Sleep disturbance is a common NPS in patients with dementia, who experience more sleep-wake cycle arousals and awakenings, diminished rapid eye movement sleep, and take more daytime naps, exacerbating the problem. 1) Chronology and onset of the emergence of NPSs. 2) Sudden decline from baseline in function of instrumental and basic activities of daily living, suggesting delirium or acute cerebrovascular event. 3) Presence of a comorbid illness, especially signs and symptoms of delirium, vascular disease (risk factor for depression and agitation), infection, pain, and constipation. 4) Presence of past psychiatric episodes (eg, mood, psychosis, anxiety), which may represent a recurrence or relapse of underlying psychiatric disorder. 5) Presence of comorbid substance use disorder or withdrawal. 6) Medication adherence, changes, and withdrawal. 2. A physical examination, including a neurologic examination, is necessary to exclude infection, pain, constipation, and cerebrovascular or cardiovascular disease as a precipitant for the NPSs. A neurologic examination is important to exclude focal neurologic signs suggestive of stroke or subdural hematoma. 3. In patients with NPSs, the regular mental status examination should include a cognitive assessment, with a particular focus on change from previous testing. The most important task is to distinguish NPSs from delirium as a cause for the symptoms, particularly in cases of an acute change in attention. The presence of sadness, weepiness, agitation, suspiciousness or paranoia, disinhibition, or apathy should be documented. It can be challenging to distinguish depression as an NPS from a primary depressive disorder or a depressive episode of bipolar disorder. In both instances, severity as well as degree of distress and impairment of function guide treatment. The cognitive assessment may include the use of the Mini Mental State Examination (MMSE), which detects largely cortical deficits; however, the copyright restrictions make it less user-friendly (see Dementia). This should be supplemented by tests such as the Clock Drawing Test and the Montreal Cognitive Assessment (MoCA), which evaluates frontal-subcortical executive function as well. The MoCA is available in multiple languages, without cost, at www.mocatest.org. In advanced stages of the illness, many patients are unable to complete formal cognitive tests. In such cases, it is important to rely on observations of behavior, speech, and response to stimuli to determine the level of cognitive impairment, noting that a change from baseline is more significant than the absolute test scores. 4. When NPSs occur in existing cognitive impairment but cannot be explained by the typical course of the underlying dementia, a formal neuropsychological assessment can be a useful tool for helping to quantify impairment and for monitoring for change over time; however, it is resource-intensive, expensive, and not recommended on a routine basis. The most commonly used scale for detection of NPSs of dementia is the Neuropsychiatric Inventory (NPI), which assesses symptoms in 12 domains (details: Table 2). The NPI-Clinician (NPI-C) version scale measures 14 domains and includes aberrant vocalization. In patients initially presenting with NPSs early in the course of dementia or where diagnostic clarification will impact on management, laboratory investigations are helpful to exclude other contributing or reversible factors. A summary of basic and more specific laboratory examinations performed to diagnose dementia: Table 3; details: see Dementia. The differential diagnoses to be considered in a patient with cognitive impairment exhibiting NPSs include delirium, neurologic diseases, infections, metabolic abnormalities, depression, psychotic disorders, and drug-related mood or psychotic syndromes. The treatment of NPSs can have a significant impact on the quality of life of the patient, their families, and caregivers. Referral to a geriatric psychiatrist, where available, a psychiatrist, or a geriatrician should be considered in instances of refractory symptoms, which cause marked distress. A useful approach to NPSs, which takes into account the likely precipitants or causal factors: Figure 1. 1. Nonpharmacologic treatment: The first line of treatment should always be to identify and address the underlying cause or precipitant of the NPS whenever possible (eg, pain, infection, constipation). Symptomatic treatment consists of nonpharmacologic strategies (Table 4) and should be the primary intervention for patients with dementia and NPSs, with clinicians and caregivers responding appropriately, knowledgeably, and promptly to address the patient’s needs while searching for the most likely trigger. Since there are fewer risks associated with these treatments, it is recommended that they should always be considered first,Evidence 1Strong recommendation (benefits clearly outweigh downsides; right action for all or almost all patients). Moderate Quality of Evidence (moderate confidence that we know true effects of the intervention). Quality of Evidence lowered due to heterogeneity, imprecision (small sample size), and indirectness (population of volunteers, inability to separate different components of interventions). Livingston G, Johnston K, Katona C, Paton J, Lyketsos CG; Old Age Task Force of the World Federation of Biological Psychiatry. Systematic review of psychological approaches to the management of neuropsychiatric symptoms of dementia. Am J Psychiatry. 2005 Nov;162(11):1996-2021. Review. PubMed PMID: 16263837. Gitlin LN, Winter L, Dennis MP, Hodgson N, Hauck WW. Targeting and managing behavioral symptoms in individuals with dementia: a randomized trial of a nonpharmacological intervention. J Am Geriatr Soc. 2010 Aug;58(8):1465-74. doi: 10.1111/j.1532-5415.2010.02971.x. PubMed PMID: 20662955; PubMed Central PMCID: PMC2955191. Legere LE, McNeill S, Schindel Martin L, Acorn M, An D. Nonpharmacological approaches for behavioural and psychological symptoms of dementia in older adults: A systematic review of reviews. J Clin Nurs. 2018 Apr;27(7-8):e1360-e1376. doi: 10.1111/jocn.14007. Review. PubMed PMID: 28793380. tailored to the individual patient, and their impact should be carefully monitored through the use of standardized behavioral assessment tools such as the Cohen-Mansfield Agitation Inventory. Even when specific etiologies are identified, nonpharmacologic interventions should be utilized in combination with medication (Figure 1). Family and caregivers are key collaborators and need to be involved in treatment planning. 2. Pharmacologic treatment: General prescribing principles: Prior to prescribing, in nonemergent situations it is imperative to inform patients or their substitute decision-makers of pertinent risks and warnings issued regarding medication (discussed below), to weigh the benefits versus the risks, and to document informed consent in the patient’s chart. Age-related changes in pharmacodynamics and pharmacokinetics of psychotropic medications (eg, longer time to reach steady state, longer half-life, and longer elimination time) should be taken into consideration. Lower doses, cautious dose adjustments, and regular reassessment of the need for continuing the treatment in the geriatric patients should be considered. Geriatric patients with dementia are more vulnerable to adverse effects, including sedation, anticholinergic adverse effects, cognitive decline, extrapyramidal symptoms, and drug-drug interactions. Agitation, which is often the presenting symptom of an underlying mood, anxiety, or psychotic disorder, is the most common NPS requiring specific pharmacologic treatment after other treatments have failed. Below is a summary of the options that can be utilized for NPSs. 1) Antidepressants: The evidence for benefits of antidepressants in patients with dementia is modest; however, clinical guidelines suggest a trial of an antidepressant when there is a high index of suspicion for depression causing distress (despite not meeting criteria for major depressive disorder), while monitoring for adverse effects. Adverse events associated with antidepressants include hyponatremia, bleeds, falls, fragility, and osteoporotic fractures, and their rates are fairly low. It should be noted that at higher doses, selective serotonin reuptake inhibitors (SSRIs) can cause affective flattening and worsen apathy. In patients partially responsive to SSRIs or with prominent apathy, cautious use of low-dose psychostimulants (eg, methylphenidate, atomoxetine, modafinil) may be suggested, particularly in individuals who are both profoundly apathetic and medically ill.Evidence 2Weak recommendation (benefits likely outweigh downsides, but the balance is close or uncertain; an alternative course of action may be better for some patients). Low Quality of Evidence (low confidence that we know true effects of the intervention). Quality of Evidence lowered due to heterogeneity, imprecision, small number of studies within each drug class, risk of bias, publication bias, and inconsistency between studies. Ruthirakuhan MT, Herrmann N, Abraham EH, Chan S, Lanctôt KL. Pharmacological interventions for apathy in Alzheimer’s disease dementia. Cochrane Database Syst Rev. 2018 May 4;5:CD012197. doi: 10.1002/14651858.CD012197.pub2. Review. PubMed PMID: 29727467. Because psychostimulants can induce elevation of blood pressure and heart rate, irritability, agitation, and psychosis, a careful patient selection is critical, especially in individuals with severe cardiovascular disease or other underlying cardiac conditions. Antidepressants have limited evidence for efficacy,Evidence 3Weak recommendation (benefits likely outweigh downsides, but the balance is close or uncertain; an alternative course of action may be better for some patients). Low Quality of Evidence (low confidence that we know true effects of the intervention). Quality of Evidence lowered due to heterogeneity and imprecision. Dudas R, Malouf R, McCleery J, Dening T. Antidepressants for treating depression in dementia. Cochrane Database Syst Rev. 2018 Aug 31;8:CD003944. doi: 10.1002/14651858.CD003944.pub2. Review. PubMed PMID: 30168578. especially beyond 12 weeks, in the treatment of NPSs of dementia of any type other than major depression, but there are clinical scenarios where a trial of an antidepressant may be appropriate. Patients with dementia may develop NPSs of apathy, social withdrawal, and sleep disturbance that may suggest the presence of depression but that are NPSs entirely due to dementia. Given the degree of suffering in untreated depression, a therapeutic trial with an antidepressant may be a reasonable diagnostic strategy in such cases. A low threshold for initiating antidepressant treatment should be considered in patients with preexisting history of depression or significant cerebrovascular disease. SSRIs are the preferred antidepressants in treating depression in patients with dementia and are generally well tolerated. Selection of an antidepressant is usually based upon the adverse-effect profile (particularly anticholinergic), drug-drug interactions, medical comorbidities, and cost. SSRIs may also be useful in the management of agitation and psychosis in patients with Alzheimer disease, particularly if a poorly articulated depression is a likely precipitant of the NPS manifestation or cannot be excluded when no other cause is apparent.Evidence 4Weak recommendation (benefits likely outweigh downsides, but the balance is close or uncertain; an alternative course of action may be better for some patients). Low Quality of Evidence (low confidence that we know true effects of the intervention). Quality of Evidence lowered due to heterogeneity and imprecision. Seitz DP, Adunuri N, Gill SS, Gruneir A, Herrmann N, Rochon P. Antidepressants for agitation and psychosis in dementia. Cochrane Database Syst Rev. 2011 Feb 16;(2):CD008191. doi: 10.1002/14651858.CD008191.pub2. Review. PubMed PMID: 21328305. Schneider LS, Frangakis C, Drye LT, et al; CitAD Research Group. Heterogeneity of Treatment Response to Citalopram for Patients With Alzheimer's Disease With Aggression or Agitation: The CitAD Randomized Clinical Trial. Am J Psychiatry. 2016 May 1;173(5):465-72. doi: 10.1176/appi.ajp.2015.15050648. PubMed PMID: 26771737. Although having limited efficacy, the antidepressant citalopram has been shown to be as effective as risperidone, a second-generation antipsychotic (SGA), in the treatment of agitation due to dementia. Patients who are more likely to benefit from citalopram have moderate agitation and lower levels of cognitive impairment. Citalopram should be avoided in patients at increased risk for arrhythmias and discontinued in the case of a persistent QTc >500 ms. Because of the association of citalopram with cardiac QTc prolongation, use of this medication to treat agitation may be limited to a subgroup of patients with dementia. Health Canada and US Food and Drug Administration recommend for citalopram a maximum daily dose of 20 mg for patients aged ≥60 years. The use of SSRIs for an indication of NPSs other than depression necessitates an ongoing assessment of benefits versus risks, and consideration for withdrawing the medications should be made periodically. Several other antidepressants were not found to be useful for agitation. However, sertraline at daily doses 25 to 100 mg can have a modest benefit on agitation. Some evidence suggests that the NPSs in frontotemporal dementia may be caused by deficits in the serotoninergic system, in particular the repetitive behaviors. There is limited evidence of benefit for serotonergic antidepressant agents in these patients (Table 5). Given the absence of evidence for using any other pharmacologic agents in this illness, a trial of an SSRI in these patients is warranted if the NPSs are causing distress. 2) Cholinesterase inhibitors: Cholinesterase inhibitors have only modest benefits overall for treatment of NPSs. In individuals with dementia due to Alzheimer disease or dementia with Lewy bodies, cholinesterase inhibitors may be used for treatment of apathy, anxiety, and depression, as well as disinhibition and aberrant motor symptoms. Cholinesterase inhibitors are not recommended as treatment for agitation in patients with dementia because they may worsen the agitation,Evidence 5Weak recommendation (downsides likely outweigh benefits, but the balance is close or uncertain; an alternative course of action may be better for some patients). Moderate Quality of Evidence (moderate confidence that we know true effects of the intervention). Quality of Evidence lowered due to imprecision, indirectness, and short duration of the study (12 weeks). Howard RJ, Juszczak E, Ballard CG, et al; CALM-AD Trial Group. Donepezil for the treatment of agitation in Alzheimer's disease. N Engl J Med. 2007 Oct 4;357(14):1382-92. PubMed PMID: 17914039. particularly in patients with frontotemporal dementia. 3) Anticonvulsant mood stabilizers: Treatment with anticonvulsant mood stabilizers (eg, carbamazepine, valproic acid, gabapentin) in the patients with dementia and NPSs can be considered, but use of these agents should be limited. Carbamazepine can have significant adverse events (particularly in geriatric patients) such as sedation, hyponatremia, and cardiac toxicity, and is a strong enzymatic inducer, with a high likelihood of drug-drug interactions, making the risk-benefit ratio too high to be considered on a routine basis. Valproic acid is less recommended due to very limited efficacy on these symptoms. In general, anticonvulsants are not routinely used in the treatment of NPSs, unless the patient has a comorbid diagnosis of bipolar disorder. 4) Antipsychotics: Psychosis and aggression in dementia requiring pharmacotherapy with antipsychotics may respond best to risperidone, olanzapine, and aripiprazole. The use of haloperidol should be limited to addressing agitation or psychosis in delirium only, using low doses for a brief period of time until symptoms clear. 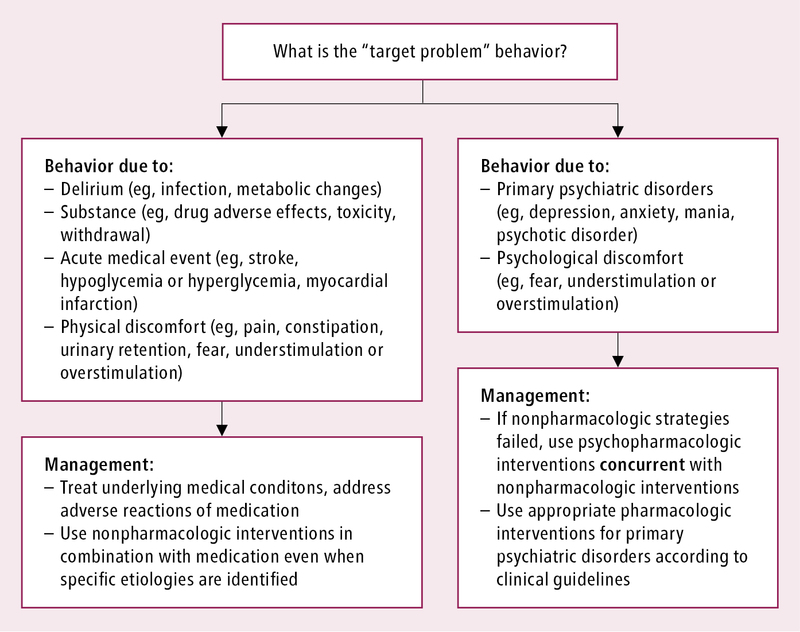 When the target problem behaviors are wandering, social withdrawal, vocalizing, pacing, touching, or incontinence, antipsychotics are not usually effective and are thus not recommended. If the behavioral disturbances such as agitation or aggression are not part of a psychotic disorder or bipolar mania but rather nonspecific symptoms of dementia, antipsychotics have modest benefits at best. The serious adverse effects of these agents, such as increased risk of cerebrovascular events and mortality, necessitate the use of antipsychotic medications as a last resort to treat NPSs of dementia and only if nondrug therapies have failed to be effective and the patients’ actions threaten themselves or others.Evidence 6Weak recommendation (benefits likely outweigh downsides, but the balance is close or uncertain; an alternative course of action may be better for some patients). Moderate Quality of Evidence (moderate confidence that we know true effects of the intervention). Quality of Evidence lowered due to imprecision and short duration of studies. Schneider LS, Dagerman K, Insel PS. Efficacy and adverse effects of atypical antipsychotics for dementia: meta-analysis of randomized, placebo-controlled trials. Am J Geriatr Psychiatry. 2006 Mar;14(3):191-210. PubMed PMID: 16505124. Sultzer DL, Davis SM, Tariot PN, et al; CATIE-AD Study Group. Clinical symptom responses to atypical antipsychotic medications in Alzheimer's disease: phase 1 outcomes from the CATIE-AD effectiveness trial. Am J Psychiatry. 2008 Jul;165(7):844-54. doi: 10.1176/appi.ajp.2008.07111779. PubMed PMID: 18519523; PubMed Central PMCID: PMC2714365. Schneider LS, Dagerman KS, Insel P. Risk of death with atypical antipsychotic drug treatment for dementia: meta-analysis of randomized placebo-controlled trials. JAMA. 2005 Oct 19;294(15):1934-43. PubMed PMID: 16234500. Gill SS, Rochon PA, Herrmann N, et al. Atypical antipsychotic drugs and risk of ischaemic stroke: population based retrospective cohort study. BMJ. 2005 Feb 26;330(7489):445. PubMed PMID: 15668211; PubMed Central PMCID: PMC549652. Notably, from 2005 onwards, regulatory agencies in North America, Europe, and Australia have issued black box warnings on the increased risk of cerebrovascular events and mortality in patients with dementia receiving either first-generation antipsychotics (FGAs) or SGAs. However, Health Canada indicates the use of an SGA, risperidone, for “the short-term symptomatic management of aggression or psychotic symptoms in patients with severe dementia of the Alzheimer’s type unresponsive to nonpharmacological approaches and when there is a risk of harm to self or others.” Common adverse events of antipsychotics include sedation; gait changes; increased risk of falls and fracture; extrapyramidal symptoms, including parkinsonism, dystonias, and akathisia (particularly with antipsychotics with high D2 blockade, such as haloperidol, risperidone, and aripiprazole); and metabolic adverse effects of weight gain and dyslipidemia (higher risk in female patients, with olanzapine and quetiapine). Longer-term use of FGAs (and some SGAs) carries the risk of tardive dyskinesia, particularly in older female patients with dementia and comorbid depressive or bipolar disorders. Most behavioral symptoms of dementia are intermittent and often do not persist for longer than 3 months. Therefore, when antipsychotic treatment is instituted, regular attempts to withdraw these medications are recommended.Evidence 7Strong recommendation (benefits clearly outweigh downsides; right action for all or almost all patients). Low Quality of Evidence (low confidence that we know true effects of the intervention). Quality of Evidence lowered due to heterogeneity and imprecision (few studies and small subgroups). Van Leeuwen E, Petrovic M, van Driel ML, et al. Withdrawal versus continuation of long-term antipsychotic drug use for behavioural and psychological symptoms in older people with dementia. Cochrane Database Syst Rev. 2018 Mar 30;3:CD007726. doi: 10.1002/14651858.CD007726.pub3. [Epub ahead of print] Review. PubMed PMID: 29605970. Generally, stopping antipsychotics for patients with dementia does not cause problems, even in those with long-term use, and it is suggested that discontinuation programs should be incorporated into routine practice. Therefore, antipsychotics can be safely discontinued in specific cases without short-term worsening of behavioral symptoms. Predictors of successful discontinuation include lower daily doses of antipsychotics and lower baseline severity of behavioral symptoms. A small subgroup of patients with more severe NPSs at baseline may be unable to tolerate discontinuation of antipsychotics and will require long-term treatment. It remains uncertain whether discontinuation of antipsychotics leads to a decrease in mortality. 5) Benzodiazepines: Despite widespread use, there is a lack of evidence for prescribing benzodiazepines safely in older adults. The risks clearly outweigh the benefits, where large-scale studies consistently show that the risk of worsening cognition, falls, and hip fractures leading to hospitalization and death can more than double in older adults taking benzodiazepines. According to Choosing Wisely Canada, the use of benzodiazepines should be reserved for alcohol withdrawal symptoms in delirium tremens or severe generalized anxiety disorder unresponsive to other therapies; other acceptable indications would be neuroleptic malignant syndrome or catatonia. Outside of these specific indications, benzodiazepines should not be used as a first-line agent in treating agitation or other behavioral disturbances in patients with NPSs of dementia. Initiating (risk of dependence) or discontinuing (risk of withdrawal) sedative-hypnotics in hospital can have substantial impact on their long-term use. Short-term use, on demand use (as needed), or use as a chemical restraint of shorter-acting benzodiazepines, such as lorazepam (often in conjunction with haloperidol), can be considered to address severe agitation or aggression. In practice, many older adults present with NPSs who have been on benzodiazepines for decades and are likely to continue to need this class of drugs; however, the goal is to taper and use the lowest doses of short- or intermediate-acting agents (lorazepam, clonazepam) that are effective. Ultra-short-acting agents, such as alprazolam, are not recommended due to their amnestic and significant dependence effects. A more comprehensive review of the common pharmacologic agents used in the management of NPSs in dementia: Table 5. Some common pharmacologic options to use versus “better-not-to-use” pharmacologic options for the main NPS clusters in dementia: Table 6. CCCDTD4, 4th Canadian Consensus Conference on the Diagnosis and Treatment of Dementia; CSF, cerebrospinal fluid; CT, computed tomography; EEG, electroencephalography; eGFR, estimated glomerular filtration rate; FDG-PET, 18F-fluorodeoxyglucose positron emission tomography; MRI, magnetic resonance imaging; PET, positron emission tomography; SPECT, single-photon emission computed tomography; VDRL, venereal disease research laboratory. bid, 2 times a day; BZP, benzodiazepine; ChEI, cholinesterase inhibitor; ECG, electrocardiogram; ED, emergency department; EPS, extrapyramidal symptoms; FGA, first-generation antipsychotic; FTD, frontotemporal dementia; GI, gastrointestinal; ICU, intensive care unit; IM, available as intramuscular formulation; IV, available as intravenous formulation; LAI, available as long-acting injectable formulation; NPS, neuropsychiatric symptom; ODT, available as orally dissolving/disintegrating tablet; SGA, second-generation antipsychotic; SSRI, selective serotonin reuptake inhibitor; tid, 3 times a day. BZP, benzodiazepine; ChEI, cholinesterase inhibitor; EPS, extrapyramidal symptom; FGA, first-generation antipsychotic; FTD, frontotemporal dementia; GnRH, gonadotropin-releasing hormone; NPS, neuropsychiatric symptom; SGA, second-generation antipsychotic. Figure 1. Identification of “target problem” behavior and its management.